If you've ever considered getting fitter, meeting new people, or earning good money, then consider joining the Army Reserves. Army Reserves is an opportunity to be part of the Australian Defence Force part time, learning all the leadership and teamwork skills without having to commit to a full time work load. The Army Reserves can become a part time career, or a casual activity, depending on what you can commit. Some work as little as 14 days, and some over 100, in a year. Reserves will usually attend one night a week, as well as some weekend commitments, and occasional two-week training camps. The Reserves is able to work around other work commitments you may have, so that it can fit into your life. Fitness is a large part of being involved and so you are provided with a great avenue to get in better shape. Skills such as leadership, organisation, problem solving, and communication are all valuable real life skills that are gained in the Reserves. It can be a great spot to gain valuable skills that will help you further your career in a variety of areas. As well as personal benefits, being a part of the Army Reserves can bring many benefits to other people. Members of the Reserves are deployed on humanitarian missions to disaster zones to provide relief to those in need. You can also travel to countries to help with training of local police and armed forces. Members of the Reserve work together with full time Defence Force staff in these missions, but all deployments for members of the Reserve are optional. You don't have to head overseas unless you choose to. Any income you earn from the Army Reserves is tax free, meaning all the money goes to you. This means that the Army Reserves is a great activity to participate in, while still working your regular job. You'll have fun, meet new friends, and gain some invaluable experience. If you want to learn more about the Reserves head to their website or call 131901 for more information. 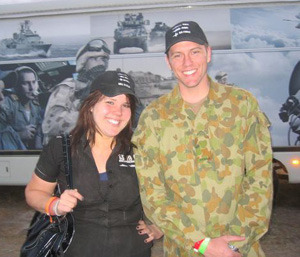 The Army Reserves operate all over Australia, so you should be able to find a local unit near you. You can also join the Reserves in either the Navy or Airforce.